Well this is my first article for Flashing Lights in my new role. I am into week three now with St John Ambulance Australia (NT) and I am loving every minute of it. I have been getting out and about to meet as many people as I can across our administration, ambulance and volunteer sectors and will be scheduling time in the next few months to come out on shifts, attend events, tag along to a ‘First Aid in Schools’ session and observe in JESSC to learn more about the great work we do. Darwin has recently experienced Tropical Cyclone Marcus and is still feeling the effects of the damage it caused. I was so impressed by the way everyone across the organisation came together as a team to prepare for the cyclone and worked through the recovery phase together to get us back to business as usual. Last week I attended the National Leadership Group for St John Ambulance Australia, which is comprised of all the CEOs from across Australia. As this was my first meeting it was a great opportunity for me to learn what the rest of Australia are implementing in terms of AED registers, training for the public and volunteers and contributing to equitable access to health care for all. There were certainly some great initiatives. 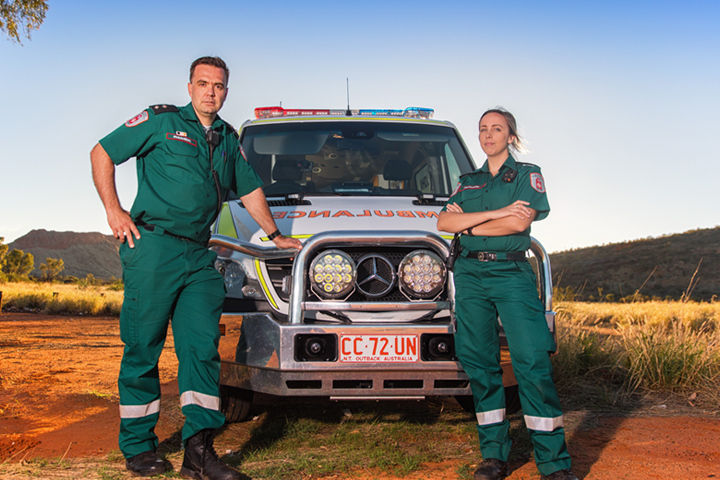 One to note for the diaries coming up in April in Alice Springs will be the Rural Outback and Remote (ROAR) conference organised by Paramedics Australasia. AHPRA will be attending and speaking on Paramedic Registration and it is likely to be an important event for those working in the field. On a personal note I am enjoying getting to know the NT and learning where all the great eating places are. The devastation left in the wake of March’s powerful Tropical Cyclone Marcus continues to dominate local headlines, as well as occupying the thoughts of many NT residents. From the first warnings of the tropical low to the ongoing clean-up efforts, St John Ambulance NT staff and volunteers have been dedicated to helping local people stay safe throughout the chaos brought on by this dramatic weather event. 11 cyclone shelters across the Greater Darwin and Palmerston area were opened and manned by St John Ambulance personnel over the weekend of 16th March, providing a safe place for all those who needed it in the lead up to and during the Tropical Cyclone. At the height of the cyclone’s ferocity, 130 people were in supported shelters, with the majority at the Supreme Court Shelter in the City. During the weekend’s events, we supplied an Incident Management Structure to support and oversee normal business operations, as well as the additional requirements of providing health support to public shelters. This included St John Ambulance supply staff preparing and delivering our cyclone shelter kits. Our ambulance fleet was dispersed around the Darwin centres to ensure we had 4WD ambulances in place where they would be needed. We were also able to supply an additional emergency ambulance to support Darwin operations on the Saturday and Sunday. Many Darwin residents lost power and water at their homes following the cyclone and needed to rely on the compassion of others for accommodation and assistance with property damage. At St John Ambulance NT we are proud to have worked alongside our colleagues in the emergency services, as well as our neighbours, friends and family to pull together and lighten the burden during this difficult time. Our ladies “The Buzz Cuts” from St John Ambulance NT have raised an astounding $5654 (and still counting) for the Leukaemia Foundation. On 5th March, in front of a crowd of family, friends and work colleagues “The Buzz Cuts” auctioned off the right to chop off their lovely long locks in support of the World's Greatest Shave. Paramedic Nick agreed to have his hairy legs shaved if his lovely wife Jo could raise over $1000 towards the cause. Jo rose to the occasion and raised over $1,700 on her own and Nick’s hairy legs were treated to a full shave! It was a brave feat by the ladies who are now supporting a fresh “buzz cut” look. According to the Leukaemia Foundation website, more than 60,000 Australians are living with blood cancer or related disorders and the equivalent of one person every 41 minutes is diagnosed. “The Buzz Cuts” would like to thank everyone who baked cupcakes, made coffees and donated money towards their shave! What a great morning all round. March’s International Women’s Day (IWD) Breakfast in Darwin was a morning of firsts. Not only was it the first event of its kind at SKYCITY Darwin for IWD, but it was also the first we spent with our new CEO Judith Barker - the first female CEO of St John Ambulance NT. In fact - Judith is making history as the first ever female CEO of any Ambulance service in Australia! We think this is pretty amazing. With over 300 people at the breakfast representing the Northern Territory's emergency services, we couldn’t have been more proud to be part of it and to have our own guest speaker Emily Bynon (Acting Regional Manager – Northern) talk of the challenges and opportunities as a woman in a leadership role within emergency services. It was wonderful to hear such inspirational words from the speakers, who emphasised the importance of female role models, reaching your full potential and treating every single person with respect. The morning was a fantastic opportunity to focus on how far we’ve come, and the challenges still ahead for gender parity. Thank you to SKYCITY Darwin, Northern Territory Police, Fire and Emergency Services and everyone involved in this event, we look forward to next year’s! Support St John Ambulance and you’ll be rewarded! We are raising funds for our fundraising and you can help. Order the NEW 2018 | 2019 Entertainment Book or Entertainment Digital Membership and you will receive hundreds of valuable offers for everything you love to do, and you will also be supporting our fundraising. PLUS, order now to receive up to $200 of bonus Early Bird Offers (hurry, these sell out quickly). Click here to support us now! Copyright © All rights reserved | St John Ambulance Australia (NT) Inc.